I think it’s way too easy for me to make Gokkie comparisons, but I can’t help but see parallels between that generation and our newest 9th gen (Kyukkies?). I’ve been watching the only H!P show that I know of Bijo Gaku. There is a whole lot of S/mileage on there, but they’ve included a few glimpses of our four new members. I got to see some of the fan event, where they were all adorable and energetic to the extent that Mame and Shige said variations of, “wow, the new member are awesome!” For once we have some girls who step forward, who act silly. I’m getting a soft spot for them and I haven’t even heard them in a single yet. Since I am sick and fatigued and (for once) taking a sick day, I decided to comb through all the H!P stuff I haven’t watched yet. 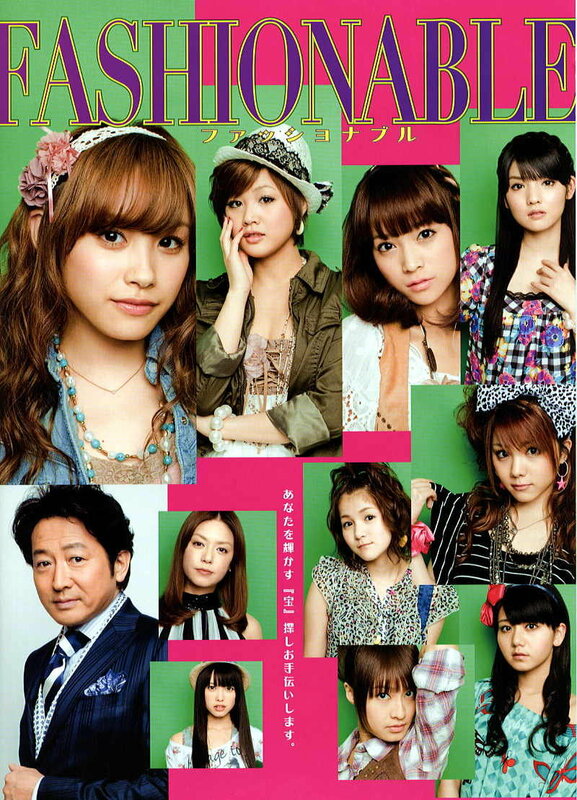 That is no small task, but I finally landed on Fashionable, the last play to feature the 8nin Momusu of 2010. Forgive me if any of this review reads funny; I’m not exactly at my best. I haven’t seen the whole Cinderella play yet, but from what little I did see, it seemed like there wasn’t that much for most of of the girls to do. There was a lot of emphasis on Takahashi Ai. Being the star, and completely awesome at plays, this makes sense, but after Ribbon no Kishi, I really wanted a play where everyone at least got a LINE. Fashionable is about a little shop called Tresor; their business is failing and even though Coco (our heroine) tries her best, they want to call in outside help. But wait – this famous ‘fashionable’ man is someone from Coco’s past!? Of course the store is manned by Coco and her colourful friends. The cast is basically Momusu and five other actors, one of them Chompy from C-ute (Saki? Nakki? Whatever her name is?). I don’t know the names of the other actors, but the male lead is elegant, commanding and otherwise awesome. The two little Eggs manage to be sweet as pie and somehow real too. So what about Momusu then?